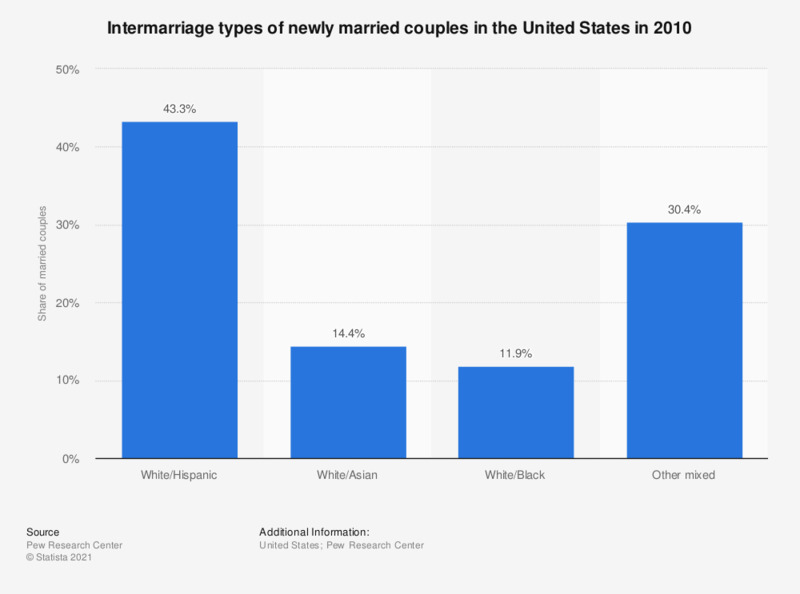 This statistic shows the distribution of intermarriage types of newly married couples in the United States in 2010. In 2010, White/Hispanic-couples accounted for 43,3 percent of all interracial or interethnic marriages. The data is based on Pew Research Center analysis of 2008-2010 American Community Surveys (ACS) Integrated Public Use Microdata Sample (IPUMS) files. Note: Asians include Pacific Islanders. Whites, blacks and Asians include only non-Hispanics. Hispanics are of any race. “Newly married” or “newlyweds” refer to couples who got married in the past 12 months prior to the survey date (American Community Survey).